A wrought iron fence adds a touch of elegance and distinction to any property. A wrought iron fence adds a touch of elegance and distinction to any property. When you’re caring for your lawns, plants and other outdoor features of your home, don’t forget that your fence also requires regular maintenance. Protecting your wrought iron fence from rust will extend its life and looks. The best way to deal with rust on iron is to prevent it in the first place. If your fence is newly installed or just hasn’t been exposed to a harsh winter or rainy spring yet, the best way to prevent rust is by coating it. Rust-proof coatings act as a barrier between the metal and the elements of oxygen and moisture which combine to rust any metals primarily stored or located outdoors. Rust-proof coatings come in either a spray form or in paint cans to be applied with a brush. They not only provide rust protection, but also help resist dirt buildup and fading. Normal paint itself can also help to protect your iron fence as it will also act as a barrier between the metal and moisture. Considering the climate you live in can give you hints about how much protection and maintenance your fence will require. Consider if it will be subject to extreme changes in temperature, whether you live in a particularly humid climate, or if you live near a coast where salt water is a factor. Oil and wax-based solutions will be your strongest defense against these factors. 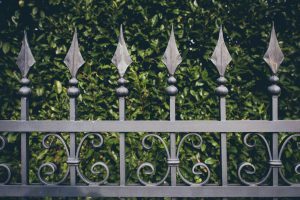 If you do go out to examine your wrought iron fence and find rust beginning to form in various places, there are a couple simple methods you can use to restore it. Start by cleaning your fence by using a paint scraper or sandpaper to remove the rust that you see. Rinse off the residue from the work that you’ve done and then apply your chosen rust coating. This entry was posted on Friday, September 1st, 2017 at 1:10 pm. Both comments and pings are currently closed.